American history is presented in fun, bite-size morsels in this entertaining book. 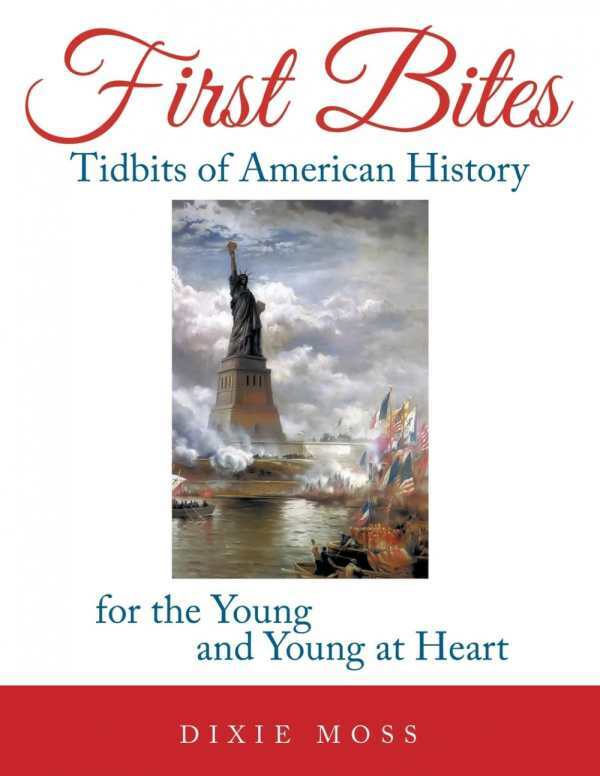 In First Bites: Tidbits of American History for the Young and Young at Heart, former elementary school librarian Dixie Moss brings America’s past to life for today’s students by using catchy, rhyming poems to introduce significant people, places, and events. It’s an interesting and entertaining way to learn about history; Moss even draws on her own background to personalize some of the facts she imparts. Forty-six topics are presented, beginning with Christopher Columbus and his explorations and ending with the moon landing. People highlighted include George Washington, Paul Revere, Davy Crockett, and the Wright Brothers, among others. Locales include the Alamo and the Old Chisholm Trail. The slim book follows the country’s westward expansion, covering such areas as the Pony Express, the steam locomotive, and Dixieland jazz. Events unfold in a seemingly chronological order, though actual dates are rarely focused on or mentioned. These really are tidbits of American history—they are fun, bite-size morsels that may prompt the intended audience to search for more in-depth information on an area that sparks interest. Aboard a steamboat on the Mighty Mississip’. To build up steam…we’ll need more and more. The next page goes into more detail—how invaluable the steamboat was for transportation, how the Mississippi River served as “the great river highway,” and that Mark Twain worked on such a boat. Above each poem is a colored illustration or photo depicting some aspect of the topic. A picture titled The Lone Prospector precedes the poem “The Forty-Niner,” which tells of a man going to California because “there’s gold in them thar’ hills they say.” The author relates here how her own great-great-grandfather and his travels west inspired this particular rhyme. She incorporates her own personality into the text as she explains that Sacajawea, Lewis and Clark’s Native American guide, has always been a heroine of hers. All eighty-four illustrations or photos are cited, the majority from the Internet or the author’s personal collection. More stringent editing of punctuation (commas, dashes, quotation marks) in certain spots would make this an excellent primer for elementary students. Also, a table of contents might be helpful for specific searches. The idea for this book was born from rhymes the author created about America for her young granddaughter when she was an infant. The nineteenth-century topics in particular appear to be covered nicely, and while a book such as this could not, of course, be all-inclusive, a sequel with more emphasis on the twentieth century would be savored as well. Disclosure: This article is not an endorsement, but a review. The author of this book provided free copies of the book and paid a small fee to have their book reviewed by a professional reviewer. Foreword Reviews and Clarion Reviews make no guarantee that the author will receive a positive review. Foreword Magazine, Inc. is disclosing this in accordance with the Federal Trade Commission’s 16 CFR, Part 255.